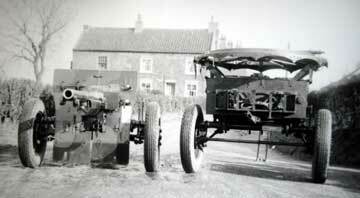 75mm Guns of the 66th Anti-Tank Regiment, Hull, 1941. 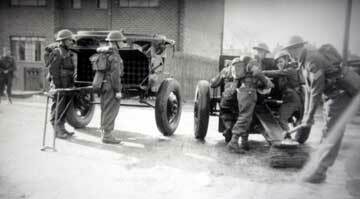 'G' Troop, 263 Battery of 66th Anti-Tank Regiment RA (The King's Own) TA. Winners of the Regimental Shoot, Larkhill, December, 1941. Top row, left to right, Gunners A W Drury, J McQuilliam, McCullough, H Spiby, R Oldham, J Llewellyn, Talbot and H Wilson. Centre row, left to right, Gunners W Thompson, T Goodier, W Stubbs, RT Turner, G Shelley, H J Turner, A Kirwen, W Blythe, A Edge. 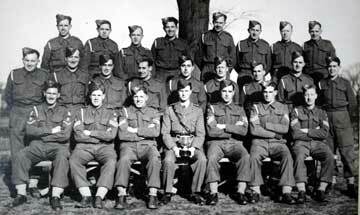 Front row, Lance Bombadier A Thurgood, Sergeants F Nichols, A Dobson, Captain T R L Greenhalgh, Sergeants L J Powell, S Reid, and H Greenhalgh. 66th Anti-Tank Regiment, Northern Ireland, 1944. 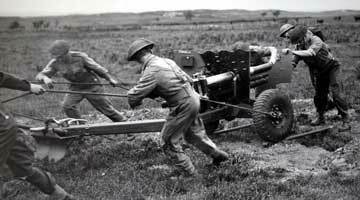 6 pound Anti-tank gun being manhandled over trench. 66th Anti-Tank Regiment, Northern Ireland, 1944. 17 pound Anti-tank gun firing at practice camp, the gun is shown at full recoil. 66th Anti-Tank Regiment, Northern Ireland, 1944. 17 pound Anti-tank gun firing at practice camp.